Cape Coral & Fort Myers Lawn Mowing Service | Get A Free Quote Today! Enjoy the benefits of having a professionally maintained lawn from McFarlane's Lawn & Landscaping. We are not the typical lawn mowing contractor, we have a team of professional lawn and landscape specialists that are uniformed and will arrive on time in a clean company vehicle, so you will know who is on your property. Call us today at 239-220-8709 to experience the positive difference of working with a professional lawn mowing service. To keep your lawn looking green and healthy it is important to mow your grass on a regular schedule. In addition to mowing, changing directions each time will help keep your lawn looking healthy, rut-free and the best on the block. We blow off your driveways, sidewalks, and patios. This service is provided by the exceptional staff that takes pride in your grass looking the best it possibly can. We always go above and beyond! It doesn’t stop with just mowing your property, we make sure that the equipment that we use at your home is maintained on a regular basis. We believe it is important to keep our equipment running properly so that our staff can do an efficient job in a safe environment. We change our blades and wash our mower decks out daily to ensure that our mowers cut, not tear, your grass. To get a professional manicured lawn it is necessary to mow your lawn on a regular basis. A proper mowing schedule will cause less stress on your turf allowing it to look it's best. But there is more to properly caring for your lawn than just mowing it consistently. Our lawn mowing experts are highly trained in best practices for maintaining yards here in Florida. For example we stagger our mowing pattern, line trim around flowerbeds, trees, fences and other obstacles in the lawn, edge with a steel blade edger and we are sure to blow off your sidewalks and driveway. 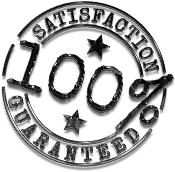 Our commitment to quality lawn mowing service doesn't stop when we are done mowing your lawn, we meticulously maintain our equipment by cleaning our mowing decks and sharpening the mower blades consistently so we deliver the perfect cut with each service. 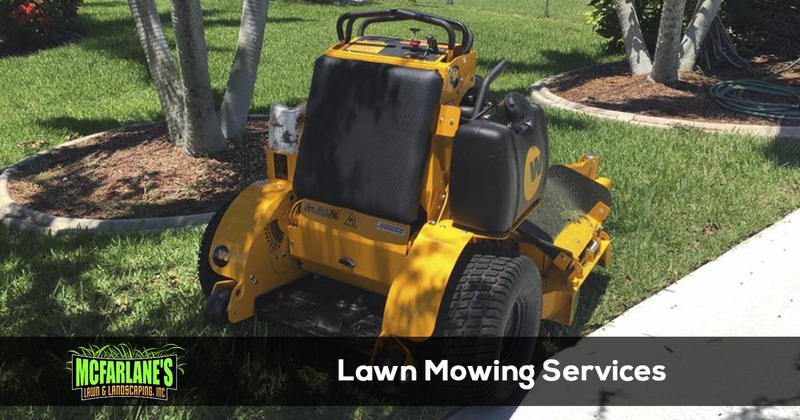 At McFarlane's Lawn & Landscaping we offer weekly and bi-weekly lawn mowing services in Cape Coral, Fort Myers and North Fort Myers. We recommend weekly lawn mowing service which is our most popular service, but we also offer bi-weekly lawn mowing services. So you can decide which option is best for you. McFarlane's Lawn & Landscaping has been providing lawn mowing service in Cape Coral and Fort Myers Florida since 2010. Our weekly lawn mowing service is the recommended and most popular service for the area because you get the best results and a healthy green lawn. For weekly lawn mowing service we mulch the clippings into the lawn as this is healthier for the lawn. Grass clippings are mainly made up of water and actually contain nitrogen, phosphorus, and potassium that are found in fertilizer. Mulch mowing can provide one-third of the annual fertilization needs of your lawn each year and does not contribute to excessive thatch build up when mowed weekly. Cutting your lawn really short, is not doing it a favor. Surface roots become exposed, the soil dries out faster and surface aeration is reduced. As a general rule, don't cut off more than one-third of the grass at any one time. Most turf grass species are healthiest when kept between 2.5 and 3.5" tall. When your grass thrives it naturally helps reduce weeds. It is best to return clippings to the lawn whenever possible. When the lawn is mowed so that less than one-third of the total leaf surface is removed, grass clippings can easily be returned to the lawn. Excessive accumulation of clippings from infrequent mowing may smother the turf and should be removed. A common misconception is that clippings left on the lawn will promote thatch buildup. This is not true. Clippings do not make significant contributions to thatch and should be returned to the lawn whenever possible. These leaves contain mostly water and break down rapidly, releasing nutrients back into the system. Returning grass clippings means that nitrogen applications can be reduced by as much as 1 pound per 1,000 square feet per year. If you are ready for your Cape Coral or Fort Myers property to be professionally maintained by the friendly and knowledgeable staff at McFarlane's Lawn & Landscaping , give us a call at 239-220-8709 today.